SweetLegs new print, Rewind has got you dreaming of jelly shoes, snap bracelets, 'Pretty in Pink', 'Walking on Sunshine' and crimped hair! With an assortment of purple, tangerine, lavender, and green cassettes set atop a black background you'll be ready to channel your inner 80's wild child and step out rocking your new, super fabulous Rewind SweetLegs!. Wanna rock an eye-catching retro-vibe? Pair your Rewind SweetLegs with a fuchsia peplum blouse, a stack of multi-coloured neon-hued enamel bangles, black knee high boots, your favourite black ¾ length cocoon cardi, and a top it all off with a low, side ponytail. The colours are amazing. Shipping was very fast, arrived earlier than expected. This print is so fun to wear! I'm so glad I got them! 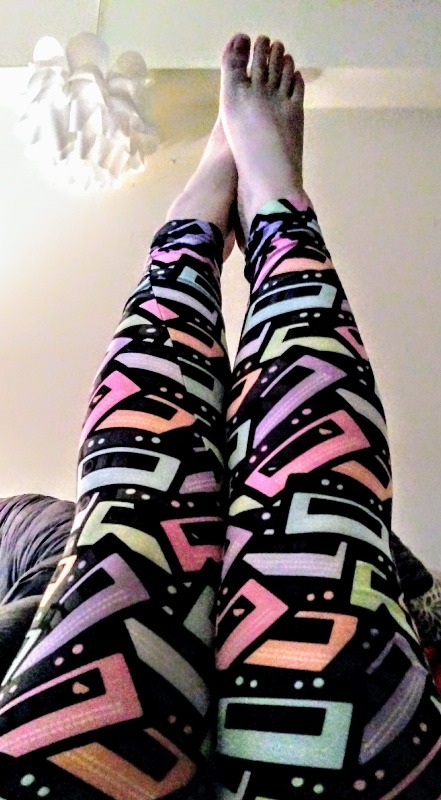 I love these leggings. They fit super comfy and really well. They even came a day earlier then they said they would. I love sweetlegs. Ordering online is easy and shipping is always quick. This order even came a day earlier then expected. Love this print! I get compliments on it every time I wear it. I am 6'1", and 220lbs, and the plus size fits me great. The fabric is also very opaque - no see-through fabric!